I am sure most of you know one of the most followed motivational Instagram pages on the planet, @millionaire_mentor. It’s one of the most praised and profitable pages on Instagram. It has more than 3,4 million followers, and its owner Jason Stone knows very well how to monetize that. He managed to build an Instagram empire in under 2 years. He really is an expert at social media and he knows how to build a huge audience in a short amount of time.I am sure that many of you want to achieve that, so listen to this interview and learn! You will find out: * when and what to post on Instagram, why every company needs an Instagram account no matter what they do, how to make a lot of money with affiliates programs, his personal success story, a lot about his background, what is the most powerful thing on Instagram right now, how to become an influencer! This interview is extremely valuable for individuals and companies who want to make a profitable brand. Hello everybody, this is Warrior Family and I’m Smillion Mori. You are all here, my friends because you believe that we can all create and live their life worth living, but in order to do this we must do something about it, and today I have a special guest for you... my whole purpose within this show is to bring you guests, their habits, their belief system, their marketing, other strategies that can help you become the person you want to become and create and live the life worth living. And today I have a special guest, as I said. His name is Jason Stone. He’s widely known by celebrities and almost 3. 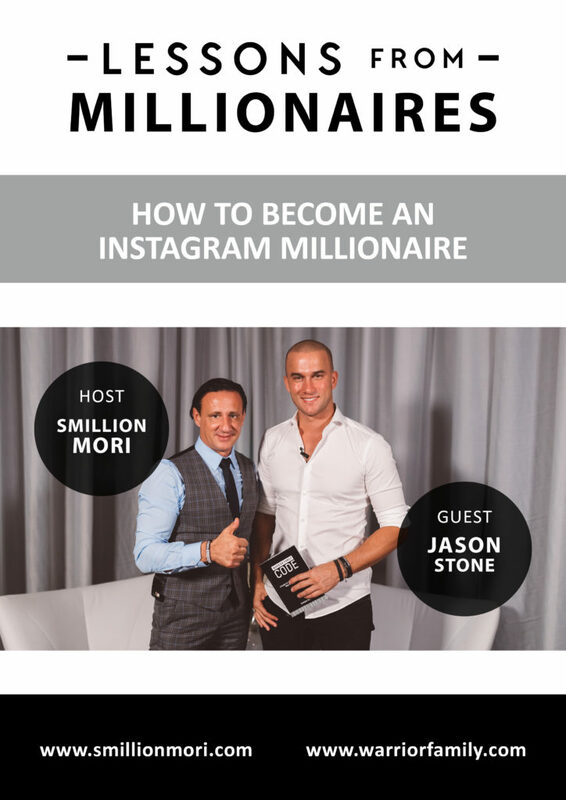 4 million people around the world as ‘Millionaire Mentor’ on Instagram. Stone has successfully launched multiple six and seven figure Instagram and Internet platforms and is becoming a very known social media influencer and marketer. Known for his e-commerce success in the automotive industry in his early years with Treadstone Performance Engineering. Jason is a mechanical engineer, real estate investor, car enthusiast, and start-up investor. Jason has co-founded the Impact Billions movement and also created Gentleman’s Mafia Instagram network, which culminates relationships and success among the thousands of its members worldwide and utilize his experience and passion as a motivator, mentor, teacher, and social media influencer to help others create success.